So in the shop right now is another Conn Bass sax that I had to overhaul. 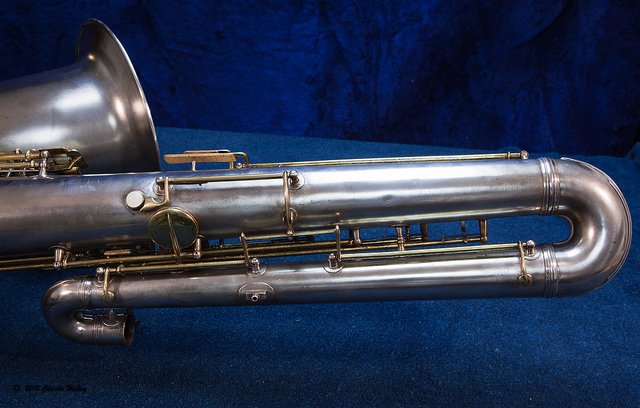 The overhaul is done but there’s still one more part of the horn I’m working on: Designing a new octave mechanism. I’m about half way finished and it’s taken me 3 days already. I’ll post pictures of the finished product when it’s completed. It works and it’s elegantly simple. The problem is that it gets out of whack pretty easily and the people using these horns (string bands mostly) are anything but careful. The horn I’m working on now had the entire assembly knocked off somewhere never to be seen again. So that gave me my clean slate to work with, just two octave pips and the actual touch key. Wish me luck with this project, it’s harder than you might think.